An Auburn Engineering faculty member and his colleague recently published an English-language biography chronicling the life and correspondence of noted composer Nikolay Rimsky-Korsakov, one of the famed “Mighty Five” Russian nationalist composers. The book, “Rimsky-Korsakov: Letters to His Family and Friends,” presents a translated and abridged version of two Russian-language books on Rimsky-Korsakov written by his granddaughter, the late Tatiana Rimsky-Korsakov. The new English-language text was edited by Malcolm Crocker, professor emeritus of mechanical engineering, and Margarita Maksotskaya, visiting scholar in the Department of Mechanical Engineering. Crocker was introduced to the Rimsky-Korsakov family in the 1970s and became a friend of Tatiana Rimsky-Korsakov, eventually helping her publish the second Russian-language book on her grandfather after the publisher ran into financial difficulties following the collapse of the Soviet Union. Crocker joined Auburn University in 1983 as professor and head of the Department of Mechanical Engineering following a 14-year career on the faculty of Purdue University. An expert in acoustics and vibration, he has been a longtime member of the International Institute of Acoustics and Vibration, serving as executive director since 1995. He retired from Auburn in 2011. Maksotskaya has worked at Auburn since 2010. She has a bachelor’s degree in music and a master’s degree in linguistics from Saint Petersburg State University in Russia. 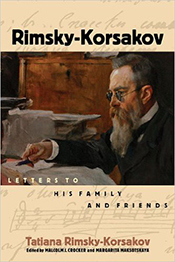 “Rimsky-Korsakov: Letters to His Family and Friends” is published by Amadeus Press. For more information about the book, visit the publisher’s website.